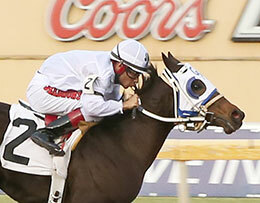 Remington Park Oklahoma-Bred Futurity winner La Vencedora tops the first 2-year-old poll of the year. AMERICAN QUARTER HORSE ASSOCIATION�MAY 3, 2017� The initial AQHA Racing National Poll for 2-year-olds was essentially a three-horse race for the top spot, with La Vencedora, winner of the $1,002,500 Remington Park Futurity (RG2), leading the field by a slim margin. The Oklahoma-bred filly by IVORY JAMES, who tops all Quarter Horses in North America by earnings this year at $382,006, earned 85 out of 100 possible points in the voting. Another Remington Park-based horse, Ima China Rush, took the No. 2 spot, with 81 points. The daughter of Rushago captured the $525,050 Oklahoma Futurity (G3) in March and then finished second by a nose in the Laico Bird Stakes (R) in April. This Is An Eagle, winner of the Sam Houston Futurity (G2) this past weekend, finished a close third in the voting with 75 points. HEZ OUR PRIZE (9), EAGLES SOAR (8), DYNAMIX (7), MOUNTAIN HOLME (7), WEETONAS LAFAWN (5), SUMMERTIME FAVORITE (3), TTT KAS (2), CAPITAN JIMBOB (1), MISS TEE LAJOLLA (1).